Second, I work through the "Reading Assignments Chart" and "Alternate" charts unit by unit. I keep a highlighter and pencil handy, highlighting resources we own and underlining the resources available at the library, using a pencil to note the Call # for easy reference later. I like to do this before I make my purchases because I often find that I or the library have alternate titles that can be used, reducing the number of primary resource purchases I need to make. If the exact title is not available but I see a similarly titled resource of comparable length while I'm doing my library searches, I usually make a note of this in pencil and place a question mark next to the resource so that I can check it out. 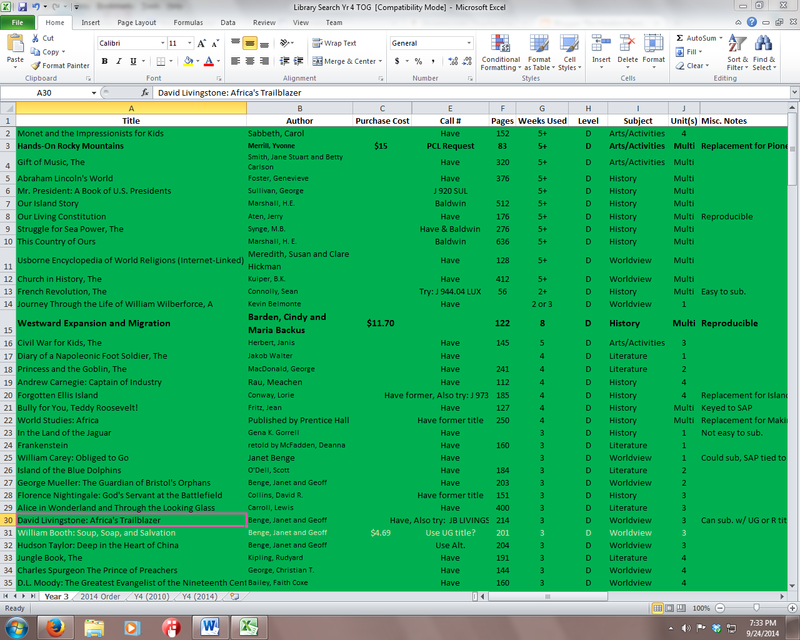 As I go, I update the Excel spreadsheet that I started so that I have a better picture of which resources I actually need to purchase. Depending on how much time I have, I may search for key words in the "Threads" or "Weekly Overview" pages in order to find other possible library options. (Naturally, how much time one spends on this will correlate with how tight their budget is. It can be time consuming and time is worth money too.) When I'm finished looking at the whole week, I use a yellow sticky or an index card to write all of the library titles that we'll utilize that week, noting if it is a multi-week resource that I'll need to renew. This saves me time later as I can just grab my note and go to the library on errand day without having to double-check what we need. Third, there is the actual organization of the books that we have. On the inside cover, I use a pencil to note which year, unit, and week the book is used and also the level and subject (ex. TOG Y1U1Wk1, LG-Lit). The least expensive sticky dots that I found were these. I use the appropriate color for the year plan and write the week used on the dot. Since I am teaching multiple levels, I also purchased these cute smiley stickers and place the appropriate color dot for the level resource. This makes it easy for each level student to find the appropriate resource for them. After I have those dots in place, I use packing tape to make sure they will stay in place for a while. :) I have one shelf for each unit and separate each unit with bookends, using the Tapestry binder as a sort of labeling divider. Fourth and finally, I use software to keep a running list of the books in our collection, mostly for insurance purposes since our collection is so large. This is probably the OCD version of book organization, but we are book lovers and have thousands of books, so I had to do something to keep it all together. Before TOG, I had lots of resources that went unused because I wasn't well organized. However, TOG has given me a great framework around which I can wrap my mind and organize our resources. I'm sure there are aspects of what I do that I've missed, but this is already approaching novel-length, so I'll end here. Please feel free to ask if you have questions. I'm happy to oblige if it seems like our wacky system might serve you. You may also wish to read my related post: Making Tapestry Fit Most Budgets. There is also a helpful post on this topic at the Tapestry of Grace blog: Managing Those Living Books. *If you've found this post helpful, please consider using my Advisor code (elizabethhankins) when purchasing Tapestry of Grace year plans.